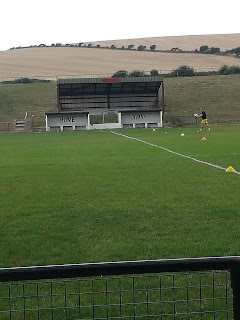 As with my visit to Peacehaven’s Piddinghoe Avenue (or the Unitbet Arena as it’s now known in these overly commercialised times) a couple of weeks ago, this wasn’t the first time I’d been to Saltdean’s Hill Park to watch a game. However, seeing as my previous visit came over 20 years ago, back in the days when I was a match reporter for the Sussex Express, I figured that another visit was long overdue. One major difference between my previous trips to the ground as an idealistic teenager to the one yesterday evening as a slightly cynical man in his late 30s, were my travelling companions. Whereas once going to football meant time spent with mates, today it often means time spent with the children – in my case, 8 and 5-year-old boys. Within seconds of paying my £5 entrance fee, it immediately becomes clear that the boys have already become spoilt by numerous trips to the Amex Stadium. “Where’s the scoreboard?” the eldest asks. “There isn’t one,” I reply. “So, we’re going to have to remember the score ourselves?” he asks, sounding truly terrified at the huge amounts of effort such a task must expend. “I’m sure we’ll manage,” I reassure him. As it turns out, there was little chance of any of us forgetting the score, seeing as the youngest asked what it was at least once every five minutes. (Once before the game had even kicked off – I’m not even kidding!). Thankfully, given the stormy conditions that had made their way to Saltdean just prior to kick-off, we managed to get a seat under one of the two covered areas on offer at Hill Park. The seated area located along the near touchline (pretty sure this wasn’t there 20+ years ago). The second, terraced covered area (pictured above), located behind the two dug-outs on the opposite side of the pitch, definitely was. 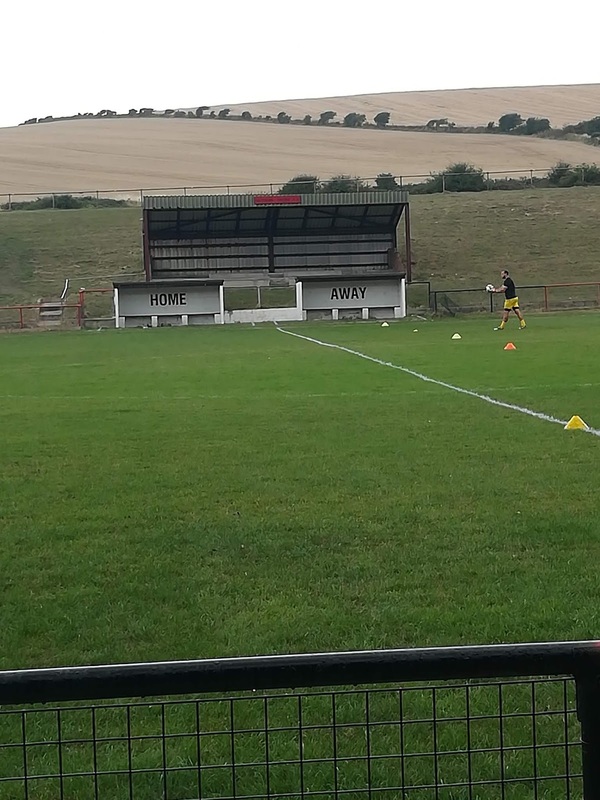 Watching the two teams warm up, I was somewhat surprised to notice one of my former 5Ways Soccer coaching colleagues, Curtis Gayler, lining up for Saltdean. I had no idea he was playing for The Tigers. Having promised many times over the years to watch him play, but never having gotten around to actually doing so, this made my return visit to Hill Park all the more worthwhile. To be honest, after 40 minutes of the match, there was no sign that we would witness a thriller similar to the one that I had seen on Saturday at Uckfield Town. Both teams seemed pretty evenly matched, with Saltdean bossing possession, but causing Heath very few problems. Then, from out of nowhere, Saltdean failed to clear a corner and Broadbridge took the lead. This spurred The Tigers on, and the final five minutes of the half were probably the most exciting of the match so far. However, a few minutes into the second half and the outcome of this game looked inevitable. A poor throw out by the Saltdean goalkeeper was eventually taken advantage of by Heath and at 2-0 there appeared no way back for Saltdean. A tactical switch to drop the impressive Jamie Brotherton deeper, led to the game completely changing. Saltdean suddenly swarmed over their visitors and, it has to be said, with the aid of some suspect goalkeeping found themselves level midway through the second half. (Have a look at the video above to see what I mean – although good to see Curt score his first goal for Saltdean). In fairness, the stormy conditions probably weren’t overly conducive to good goalkeeping. The comeback was complete moments later. Curt again was the scorer. I’m sure he wishes this was the one I’d got on video as his long-range effort seemed to swerve in the air at least three times, before flying past the bamboozled goalie. After that it was a case of the home side seeing the game out. Broadbridge tried their hardest, but didn’t really create anything of note once Saltdean had taken the lead. So, two games (four – if you include the two pre-season friendlies I attended) into my inaugural groundhopping season, and I’ve already seen 12 goals (24 if you include the friendlies). It’s good this groundhopping lark! So good, in fact, that my children spent our whole journey home begging to go with me to my next game. Better bring an abacus to the next one, then, just in case there’s no scoreboard. Peacehaven's ground is no longer called the Unibet Arena. Thankfully.